Math has been one of my weakest subjects (aside from Chinese that is), and I never enjoyed learning Math. My parents had to get me a tutor, and I more or less struggled through the subject, until I learnt probability and statistics. That was when suddenly Math made sense: it was useful, and it applied to real life! Anyway, I approached teaching Math to Junior J with a fair bit of apprehension. Yes, teaching pre-school Math is easy, since it is simple, and you can approach it in so many ways and integrate it with real life. However, my chief concern was whether I would be able to introduce Math concepts systematically, and give him a good foundation with regards to the subject. So I started asking other homeschoolers to see what Math curriculum they were using, and I found that a fair number of them were using Math U See. So I decided to try the curriculum out, and we've been using the materials for almost three months. The main draw of Math U See for most parents seem to be the fact that it is a complete, stand-alone curriculum, that focuses on teaching concepts and building mastery. The curriculum claims to teach the whys and does not focus on just memorization. It has materials catered up to the Secondary Math level. :: The manipulatives are base 10 blocks, and work like Lego bricks, so you can build layers to see how numbers relate to each other. (By the way, I love the pastel colours!) This isn't the case for the Montessori beads. These are also larger than the Cuisenaire rods and that makes it easier for little hands to manipulate. Sometimes though, Junior J gets distracted and ends up building with them. But there are times where he learns through building, like the time he found out that ten pieces of 10s was equal to 100! :: They allow kids to "see" addition, subtraction and number bonds clearly: Kids can stack the number combinations to see if they are equal, or count the "missing" blocks for subtraction. :: They also allow kids to visualize multiplication and division easily. 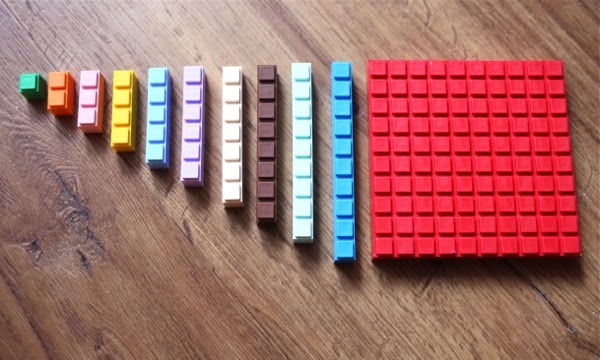 For example in the picture below, you can see that 3 x 2 is also the same as 2 x 3.
:: All in all, the manipulatives are used to teach concepts up to the Secondary Math level, which helps in terms of integrating learning. Even key algebra and decimal concepts are taught using these manipulatives, along with additional inserts. Having the different numbered blocks in different colours made it easier for Junior J to see what numbers he was adding or working with, unlike the usual base 10 blocks which come in a single colour. 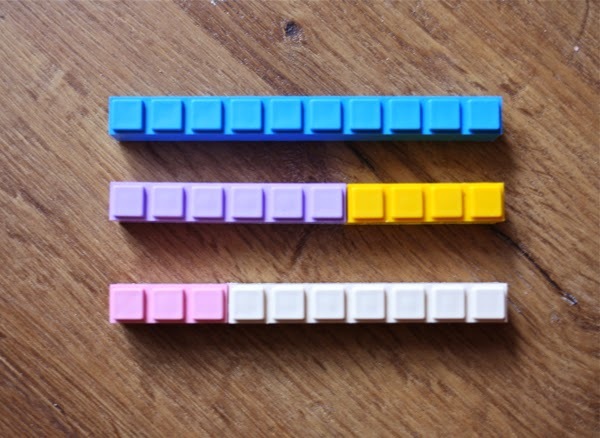 These are the blocks provided in one set of manipulatives. the Math U See wooden block box to house them too. Lessons for Math U See are taught using the manuals, where the student learns a new concept each chapter, and works through a series of problems in the Student Manual. 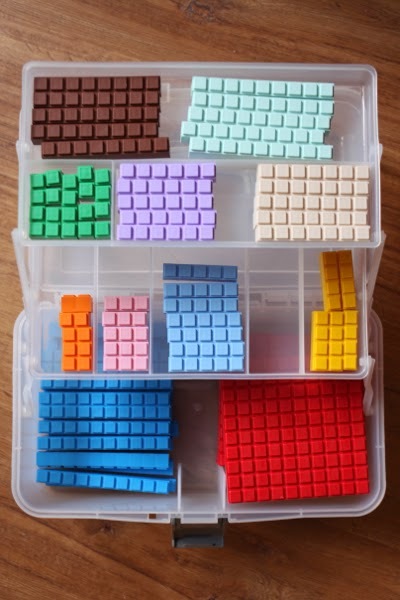 They also use the manipulatives in solving the problems, and I like how the size of the squares in the manual correspond to the size of the manipulatives, so that you can actually match them up. One of the pages in the Primer level. 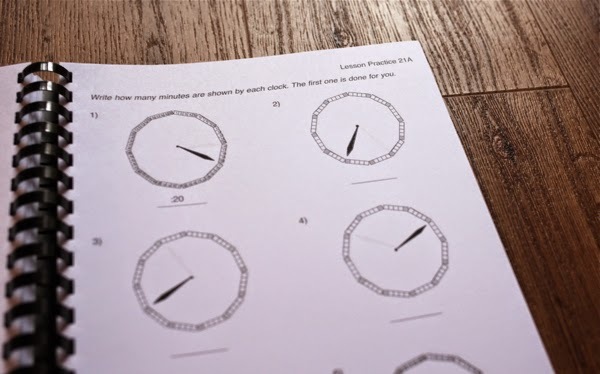 Different concepts are taught, including telling the time, which also involves the use of the manipulatives. 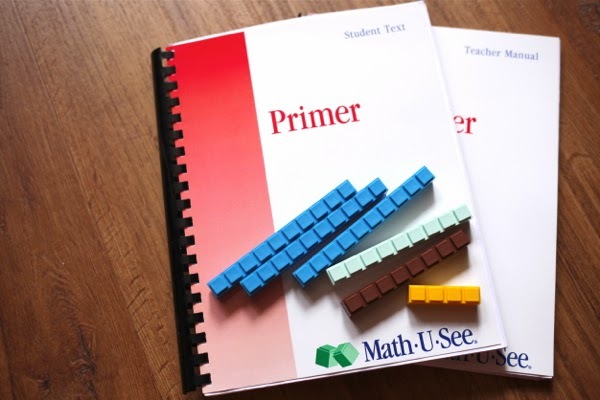 You can view the topics covered for the Primer level here, which is the first level of the series, and browse the materials (and topics covered) for each level of General Math here. 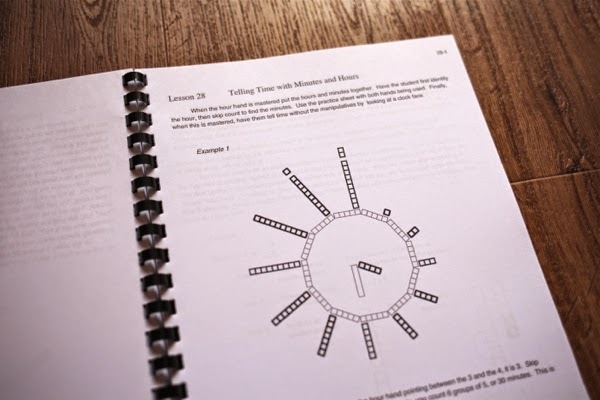 The Student Manual in each level is accompanied by a Teacher's Manual (purchased separately), which gives guidelines on how to teach each topic. These manuals come with a DVD with video demonstrations for each lesson, so that means you can actually watch the videos with your child to minimize the preparation needed on your part. You can view a sample lesson here. A page in the Primer level Teacher's manual. One thing I liked about the manuals was the way they presented the questions. The questions are phrased simply and concisely, so that the focus is on working out the math concepts and building mastery. There are no wordy, long winded paragraphs about someone eating apples and having to figure out how many apples are left. 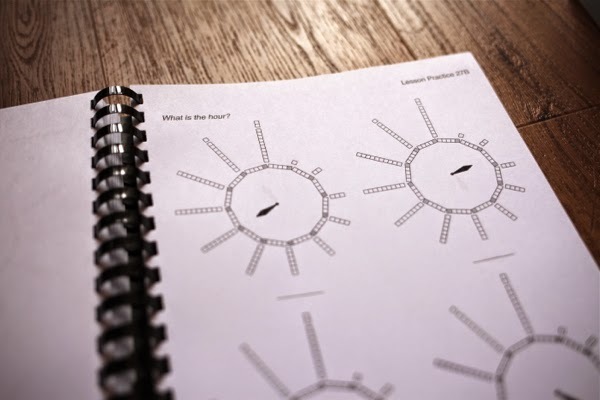 Those questions tend to require more skills from a child: the ability to read, to comprehend complex sentences and the ability to figure out what the question is asking. The books are printed in black and white print, so there are no distracting diagrams or pictures. However, that being said, this means that parents must also prepare children to solve more complex questions (in terms of language) to prepare them for the PSLE. A sample from the Beta level Student Manual. Another sample from the Beta level student manual. Another thing I liked about the curriculum was that there was minimal preparation on my part. I did not have to prepare my own worksheets and I didn't have to spend alot of time reading up. This meant we could consistently cover a little math each day, because I would just need about 5 minutes to teach Junior J the new concept, after which I could leave him to try the problems himself. However, because of the no-frills way of teaching these concepts, some might find the curriculum a little boring. And since it focuses on mastery, there is a certain amount of drill and repetition required, which sometimes frustrates Junior J. So I find that there is the necessity to adapt according to the child's ability. This may mean cutting down on the number of pages he/she has to do each time (or you might even consider skipping some repeated problems if your child gets bored, since each lesson is 6 pages long), as well as varying the lessons by including games or other math activities. Having this curriculum has been liberating: I can use this to ensure that Junior J attains mastery for Math concepts, and the time I've gained in not having to plan detailed lessons could be used to plan other Math activities for him to vary things somewhat. All in all, it is a really good curriculum to use, but of course, do make your choice based on your child's strengths and learning style! I was actually so keen on this curriculum that I approached Jenny, my contact from Green Sheep Asia (which distributes Math U See in Singapore, along with other learning materials/curricula) for this review opportunity. For those interested, do drop them an email at hithere@greensheepasia.com, and quote "MakingMum" to receive a free copy of their Skip Count Songbook and CD, when you order a set of manipulatives along with one set of Teacher and Student manuals. Do note that only ten sets are available for this promotion! 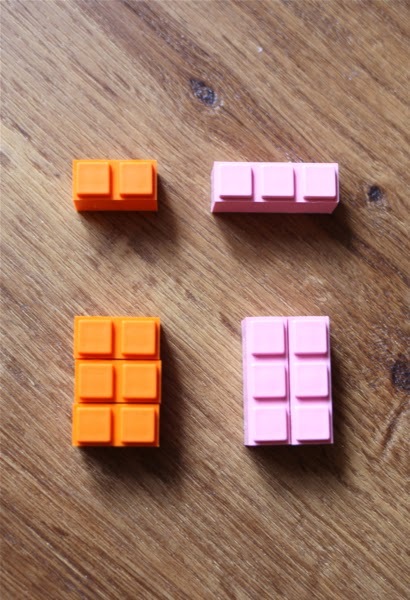 Also, I'm happy to share that Green Sheep Asia has kindly agreed to give away a set of the Math U See manipulatives to one reader of this blog! To enter the giveaway, just follow the instructions below in the Rafflecopter widget, and don't forget to comment in this blog post and leave your name and email address! Disclaimer: We received a set of manipulatives and Primer manuals for purpose of this review, and paid for all other materials. No monetary compensation was received, and all opinions are my own. My boy learns math using manipulatives, counters and printables.He's going to be 3 in December. I also found Maths very intimidating whilst in school and hope to be able to homeschool him in the subject in a way that engages him without being scary! counters, printables and through games. We include counting in our daily life, eg counting steps, counting the numbers as we go up the lift, count things around the house. We also sing number songs. My boy is currently in the numbers sensitive stage, so we have started reciting 1 to 100, basic additions like 1 + 1, etc..
Love to use colours and interactive techniques as part of the learning experience. For instance, using less words in learning materials but more colourful diagrams instead. I also try to relate what we are learning to our daily lives. History of how this mathematical concept came about is also part of our learning experience. And we also did some fractions as well. With playdough, like cut the ball (representing a whole) into halves then quarters. Um we don't really use anything. Sean naturally likes math - he likes figuring out what ages he and his brothers will be in x years, simple addition/subtraction. This set looks good coz it will help him visualize better. We use LLife of Fred series which brings math to life! : ) ang.angelia@gmail.com This will be very practical to use. Thanks Jus! I'm starting my 4 yr old on Maths and this would certainly be useful for her. So far we have only used fruits for her to teach her simple counting. My boy is 4 and learns math using counters and mainly from the Montessori Kindy that he's attending. I think it has been a very difficult journey to home teaching my elder boy who has asd. He is a visual learner but i have difficulty presenting some topics to him visually the way he learns.. especially for English! hopefully i get to win this so that i have a topic lesser to worry for my boy! My son start primary in 1 year and this will help in teaching him tha basic for his math. My boy's learning style has been eclectic but for Maths, I'm gearing towards using manipulatives as he often has difficulty understanding concepts. He seems to be responding better with them but my use of manipulatives is also sporadic. Great to find a complete curriculum like this! Maths was a subject that I struggled with in sch. Hopefully this set will help my girl in understanding maths concepts. Hope to win for my girl who is learning multiplication in school now. Thank you for the giveaway! Boys loves to hold things touch things.. My boys are also visual learners so manipulative and physical items helps them in learning maths concepts. I like to use music to teach maths too. Like singing songs to memorize formula and time tables. Love the manupulative vibrant color...and thanks for the giveaway!! My boy is 5 & currently learning simple addition & subtraction using cheerios as counters. Having this maths set will be very helpful for me to guide him in his learning. I taught simple maths by drawing diagrams, visual aids (such as toys). Agree that if we were manipulative, my child would grasp concept more easily. We just started ours a week ago! 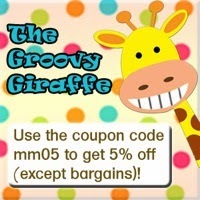 Thank you for your review, ive been very keen on Math U See for my kids... I hope i win a set! The pastel coloured manipulative will surely be a hit with my girls when learning Math! I teach using their favourite toys, and sometimes, candies! i use lego blocks for addition n substractions! Thanks for sharing. Was looking around for something suitable for my boys and these look awesome. We use toys and printables to learn maths. We use lego blocks to help in maths! We try to use everyday objects to learn ! We use cleaning-up-toys and books time to practise counting. How many transformers? How many cars? How man books? Etc etc. Heh! I'll use clean up books and counters to learn math with my girl. Thanks so much for this post! Came in handy as I'm preparing my son for P1 next year. He's having some difficulties with Math, and such colourful and interesting manipulatives will definitely aid in his journey! I use toys or I cut out some printables for my boy to learn Math as he is a Kinesthetic and visual learner. I love to use manipulatives to explain simple concept to my boy. Would love to win this as maths is not easy for a young mind to grasps without visuals n manipulative. We use simple things like marbles, ice cream sticks and Pom poms. We even count, add and subtract when eating cereal. Opposite from you, Math was my favourite subject in school! All the way from Primary to JC. But, after reading this, I'm thinking if I am not doing enough to introduce this subject to my girl. Uh oh. This sounds like a great opportunity and very handy tools to begin with. For Angel, she is quite a visual learner at this stage and basically we count things that we see outdoors, like lizards, snails and millipedes. I'm serious, she loves bugs and so why not make the most of it since she spends so much time observing them? She has also recently started reciting from 1-100 and we would do that in the car instead of listening to the radio. I seriously think I need to do more! Thanks for sharing this, Jus! We like to play math games. I am interested in a set for my children especially my 2nd child who is 5 yo and now learning addition and substration. I think this set will help when I introduce him to multiplication. 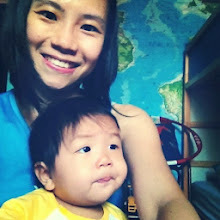 I am looking for something playful yet interactive to teach him as I find classroom learning is not helping him much. He prefers to learn from practical play and games. I love these! It is great that you such reviews coz I find them extremely useful! We use a bead board and whatever we can lay our hands on like bottle caps and bread tags to learn math. My children like to learn Math through games. Thanks for your review. I heard about Math U See from the homeschool community but I have yet to purchase it. The teaching rods and systematic way of teaching Math to the young is what appeals to me most. It is appropriate time for me to introduce Math U See to my homeschool 4yr old girl. Playing counting games and buying assessment books for him to learn. This curriculum looks interesting in introducing Math to my child. Hope to win to try it out! We use jigsaw puzzle pieces to start off counting and introduce Math. my eldest usually calculates addtion and subtraction in his head. we have manipulatives and math storybooks at home to. Thanks for sharing. My kids are 3, and 5, and for my 5 year old, we are still trying to find out how to teach her (hence was thrilled to found this blog entry of yours) .. ... so far i've tried using lego blocks as counters. We have just started using linking cubes and bear counters at home for short maths lessons. Been scouting around for effective rods for a long time. Hope to win this set! Would love an alternative math teaching tool that is fun and interactive, rather than buying assessment books off the shelves for my kids! We try to make an effort to incorporate math in our daily activities. My boy has recently gotten the hang of math concepts such as adding/subtracting and believe this teaching tool will come in useful. Hope to win this. We use everyday items like fruits, toy cars and even legos to help kids see the big picture! I struggle with maths lessons at home.. so this set wpuld really do wonders for my lityle girl who's entering primary school next year! ice cream stick, printables and games. my little one entering pri next yr. but is very bad in visualizing. thus with the set to help her, hopefully she will get better with her numbers. We use pictures and everyday objects to help our children visualize math problems. Currently not doing anything to help the kids with Math. Oops. My children learn faster through games about math concept. My girl loves to do maths while playing. She loves to be a teacher teaching her dolls using her toys, crayons. She is more a kinetic n Visual learner so enjoy doing it practically..
My 2 (3.5 and 5) learn through play with their toy cars and Lego bricks. Math is my favourite subject when I was in school as a student and a teacher. This will help a lot with getting the girls ready to love Math as much as I do. Currently my girl is learning through play and every day objects. Kiddos arr in the preschool level. At the level of simple maths lessons, I enjoy taking the lessons out to the real world of learning in the parks, supermarket, bus/train stations, wherever opportunities arises. I don't have a favourite way, I just do whatever and whenever I remember, because math is all around us and is so important to build a foundation for them! Hi Jus, may I know if you use teacher's manual and DVD to guide you in teaching? Will you think it's necessary and important? TIA for the feedback! Hi there! 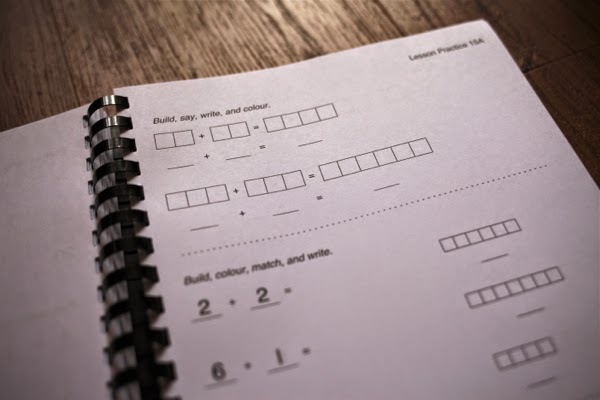 We did purchase the manual for teaching, however, for the lower levels I think its possible to just do without and use the student workbooks to guide them through. However, I think manuals are helpful for the higher levels, if you are not sure how to teach the concepts! Hi mummy, thks for introducing us to Math U see! 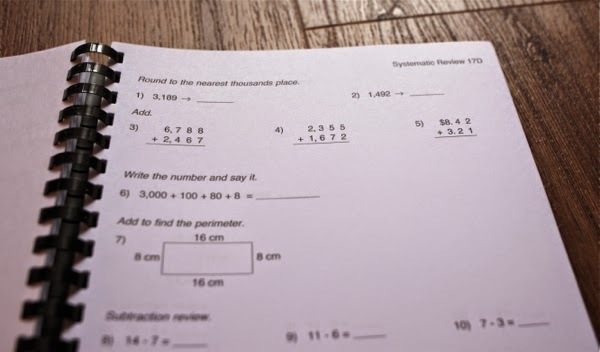 Have you heard of the "Singapore Math" method which is widely popular overseas? May I know why you choose Math U See over Singapore Math? Does Math U See also uses the same concepts as Singapore Math in solving problems?